Other Distinguishing Features: Easter Bunny is a humanoid rabbit. 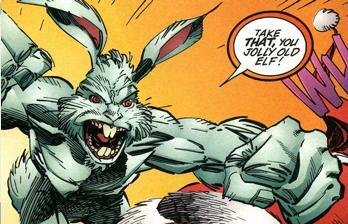 The Easter Bunny was involved in a fight with Santa Claus that took place in the Vicious Circle’s headquarters which he ultimately lost. He is later decapitated by Dart and has his his head mounted on a wall.